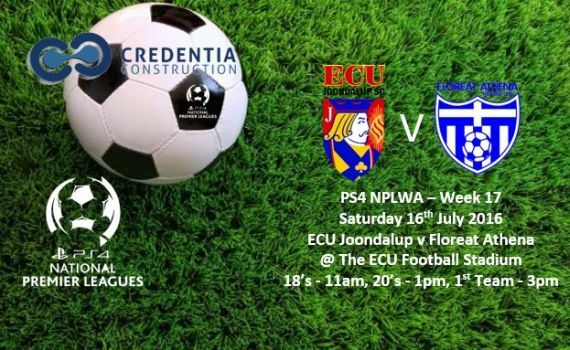 ECU Joondalup have home ground advantage again this weekend when they host Floreat Athena in Week 17 of the PS4 NPLWA at the ECU Football Stadium on Saturday. Floreat beat the Jacks convincingly in the first encounter this season, this after Gordon Smith had given them the lead at the break. Smith, who is in doubt for Saturday’s game after missing training this week due to illness, said they just want to keep improving and moving up the table. “The boys are looking forward to the game as it is potentially our biggest game yet as we can really close the gap on the top four teams,” he said. Jacks head coach Dale McCulloch said last week was a fantastic effort from his players and they deserved the points. “Last week we continued our good form in the PS4 NPLWA with a last minute winner against a good Stirling Lions side. The 3-2 win was a fantastic effort in terrible conditions and the wind was that bad Lewis’ goal kick almost landed back in his lap,” he joked. Saldaris said it’s another tough test up at Joondalup but they are determined to bounce back. “Saturday’s game is a must win for us to get some momentum heading into the Cup Final against Cockburn next week,” he said. “We’re looking forward to the challenge and we will look to bounce back. “ Jon Stynes returns to the squad after work commitments and Lewis McMahon and Clayton Arnez are back from suspension and Shaun Timmins is line to make his debut for the club, but they will be without the suspended Chris Saldaris and Blair Govan.